The state's Republican leadership has stayed silent or cheered the decision to ask about citizenship on the 2020 census, even as local leaders who represent Democratic-leaning communities sound the alarm. Funding for schools, roads and housing. Political clout in Congress. The state’s ability to prepare for natural disasters. That’s what experts and activists warn is at risk now that the Trump administration has announced that it will add a question about citizenship to the 2020 census questionnaire — a move that opponents say will likely depress response rates among Texas immigrants and their families and lead to an undercount in the once-in-a-decade count of every person living in the United States. That warning was issued by state lawmakers, lawyers and immigrants that gathered at the Texas Capitol on Wednesday to urge state and federal leaders to push back on the inclusion of the citizenship question. Action is needed, they said, to avoid jeopardizing the state’s projected gain of three congressional seats and billions in federal funding for local communities. 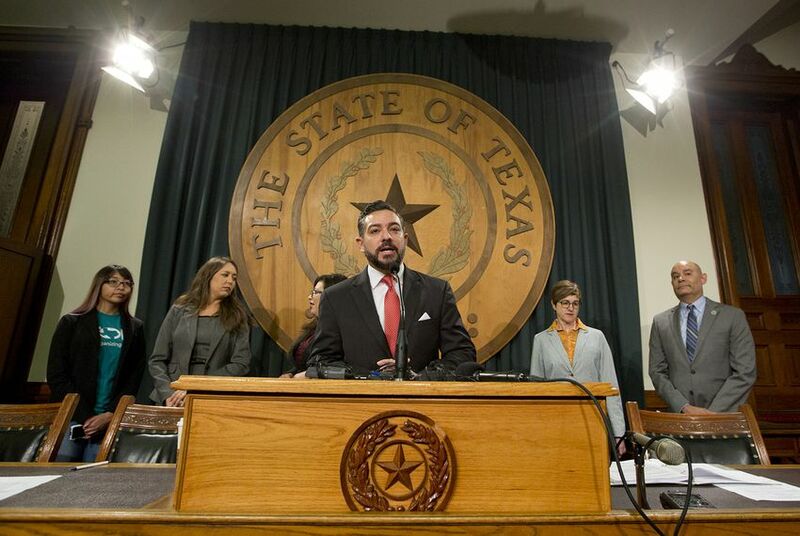 "Getting a full and accurate count shouldn’t be a Democratic issue and it shouldn’t be a Republican issue," said state Rep. César Blanco, an El Paso Democrat who chairs the Texas House Border Caucus. "This is a Texas issue." But as high as the stakes may be, the issue has still become a political fault line in Texas. The state's Republican leadership has stayed silent or cheered the decision, even as local leaders who represent Democratic-leaning communities sound the alarm. “A question on citizenship is a reasonable, commonsense addition to the census,” U.S. Sen. Ted Cruz said in a statement Tuesday, revealing that he was among those who requested that the 2020 questionnaire ask about citizenship status. Without a doubt, a census undercount in Texas has the potential to negatively affect the entire state in many ways, regardless of the state’s political majority. Immigration to Texas has been behind a fifth of the state’s growth since 2010, according to census estimates. And Hispanics — who make up a large share of the state’s immigrant population — have been behind half of the growth overall. But the immigrants most at risk of being missed in the count tend to live in greater numbers on the border and in urban areas that are more likely to be represented by Democrats. Opponents of asking about citizenship say this issue goes beyond politics. At the Capitol press conference on Wednesday, they pointed to the more than $40 billion the state receives each year through federal funding formulas that are based on the census. About $3.8 billion of that was earmarked for highway planning and construction, for example. Those opponents asked Gov. Greg Abbott and Texas Attorney General Ken Paxton, both Republicans, to join lawsuits filed by other states challenging the use of the citizenship question. Those calls are likely to be non-starters. Abbott’s office has not responded to a question about his position on the citizenship question, but representatives for Paxton have already made clear that the state’s top lawyer supports including a citizenship question. But local officials, demographers and advocates from across the state agree that the inclusion of a citizenship question on the 2020 questionnaire will be deeply detrimental to an accurate count in Texas because immigrants make up such a large portion of the state's population. Texas is home to almost 5 million immigrants — the majority of whom are not U.S. citizens. And more than 1 million Texans who are U.S. citizens live with at least one family member who is undocumented. Given the current political climate, the question could significantly discourage responses from immigrants — even those authorized to be in the country — and their families, experts and advocates said. “What the Trump administration is doing is sending chills down the spine of every immigrant in Texas and in the country,” Jessica Azua of the Texas Organizing Project said on Wednesday at the Capitol. The Census Bureau has not asked all households about citizenship since the 1950 census, though it does ask about citizenship as part of annual surveys that only cover a sample of U.S. residents. But the inclusion of a citizenship question coupled with the current anti-immigrant rhetoric would go far in “putting funding for critical programs and our children in danger,” said state Rep. Mary González, a Democrat from Clint. She was backed up by representatives from the Mexican American Legal Defense and Educational Fund and the National Association of Latino Elected and Appointed Officials — two organizations that work on census outreach efforts in Texas ahead of the national headcount — who qualified the addition of the citizenship question as an attack on Latinos who stand to be significantly undercounted. Even former directors of the Census Bureau have raised concerns about the potential fallout. “Everyone who has had anything to do with the census thinks that’s a mistake,” Steve Murdock, a Rice University professor who served as Census Bureau director under former President George W. Bush, told the Tribune in previous interview. The gap in concern between state Republican leaders and local elected officials is perhaps best reflected in Houston, which is home to almost 700,000 immigrants. While Cruz was asking Census Bureau officials to include the citizenship question because it is “imperative that the data gathered in the census is reliable,” local officials in the senator’s hometown were fighting the idea. Brandon Formby contributed to this report.